Portion control is critical to achieving weight loss after surgery. Using a portion control plate will make it much easier for you to change your eating habits. After having weight loss surgery you will find that the amount of food you are used to eating is different to the amount you can now digest. A post op diet plan will help you to retrain your eating habits and become more sensitive to food textures and the feeling of satisfaction after eating. Controlling food portions is crucial to succeeding in weight loss. Good portion control and healthy eating will aid longterm weight loss and ensure you meet your target weight. If you don't have food allergies you should have no problem digesting all types of food. It is possible in weight loss surgery, however, that certain foods you enjoyed before the operation simply doesn't agree with you after surgery. When choosing a diet plan you should aim to include a large variety of healthy foods which are rich in protein and fibre. 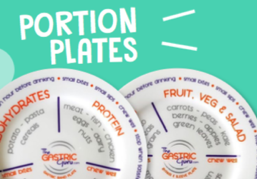 The Gastric Guru Portion Control Plates are carefully designed for the different surgery types and portion sizes are mapped by the quantity of nutrients you should be ingesting with each sitting. Using a portion control plate is the best way to ensure you follow the best guidance for your surgery type. Remember: small bites, small sips, chew well!